For the past year or so, I've been on a major granola kick. It's become my go-to breakfast. I usually top mine with a few spoonfuls of vanilla yogurt and fresh fruit if I have it on hand (blueberries are my current fave). I've tried a bunch of different kinds, but have settled on the vanilla almond flavor - especially the kind from Trader Joe's. Then one day, I thought, why not try and make my own version? I had heard it was pretty simple to make, and is very forgiving (i.e. you can't really mess it up). 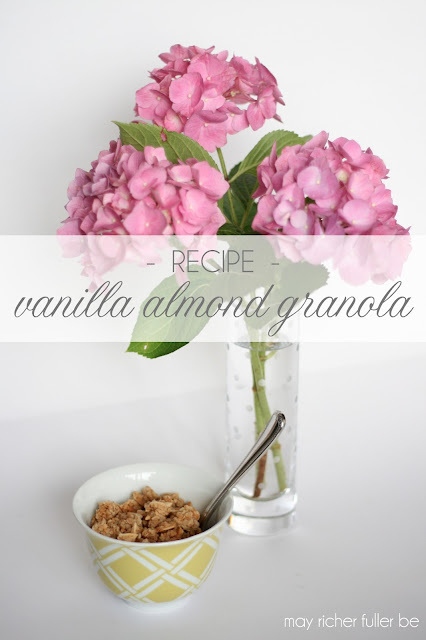 So I set about finding a recipe that looked yummy, and came across this one from Sophistimom. I didn't have all the things she used in hers, so I adjusted the recipe and used what I had on hand. The results were really good! And my husband loved it. Win. If you're looking for an easy vanilla almond granola recipe, this one's it. The beauty of it is that you can add anything you want to it. I'd love to add some "super food" grains in the future (like chia and flax seeds) to make it super healthy, but for now, this'll do :). spread ingredients out on parchment lined baking sheet (I like to use my Silpat baking sheet liner - if you don't have one of these, it's definitely worth the investment). bake at 300 degrees for 15 minutes, stir the mixture with a spatula, and return to oven. raise oven temperature to 350 degrees and bake for another 15 minutes until oats are golden brown. remove from oven, allow to cool completely, and store in airtight container. You may have to cook yours a little longer or a little shorter depending on how quickly your oven cooks. If you want it to be dry and crunchy, cook it an extra 5-10 minutes. Ours was still slightly chewy after cooking using the instructions above. 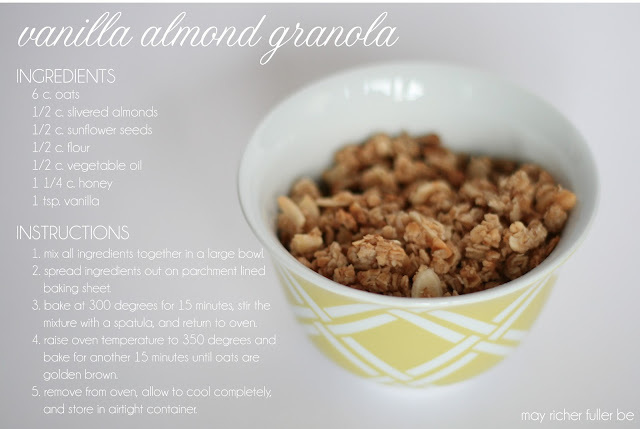 Are you a granola eater? If so, do you make your own? What's your recipe? I'm always looking to try new variations! Funny you should ask. I eat granola every day too. Here's my version (really Alton Brown's version with a few modifications): http://piesandpuggles.blogspot.com/2012/09/homemade-granola.html. Sorry no pictures. I'll have to rectify that next time I make a batch! This looks delicious! And I love the pinnable recipe card you made ;) Thank you so much for sharing at Give Me The Goods Monday! Top hosting companies in usa. Amazing work you're doing here.